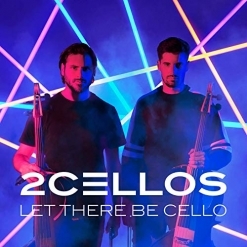 I recently reviewed 2Cellos’ 2018 release, Let There Be Cello, and absolutely flipped. I hungrily went looking for more of this amazing duo’s music and grabbed their previous release, Score. This 2017 collection of favorite movie music is performed by the marvelous cellists from Croatia and backed by the London Symphony (Robin Smith conducting). Score is gorgeous and the arrangements are stellar, but after the unbridled excitement of Let There Be Cello, this one is a bit subdued. 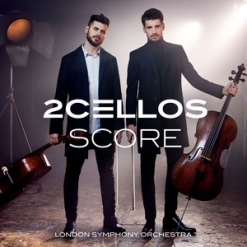 (For people who prefer 2Cellos’ more classical side, I’m sure that’s good news!) The music comes from fourteen movies released as far back as 1961 (Breakfast at Tiffany’s) up through a medley from Game of Thrones. Most are classics, but I wasn’t familiar with a few of the tracks. 2Cellos is Luka Sulic and Stjepan Hauser. Both artists have played the cello since childhood. Sulic graduated from the acclaimed Royal Academy of Music in London, and Hauser from the Royal Northern College of Music in Manchester, both in 2011. Both have won many top prizes in international music competitions. 2Cellos rose to fame in 2011 when their version of Michael Jackson’s “Smooth Criminal” took the world by storm. The YouTube video became a massive viral hit leading to a record deal with Portrait/Sony Music Masterworks and an invitation to join Sir Elton John on his worldwide tour. They have appeared on a number of television shows and are currently touring the US in support of Let There Be Cello, their fifth album with Sony Music Masterworks. Score begins with the Medley from Game of Thrones, the most intense and exhilarating piece on the album. “May It Be” from The Lord of the Rings: The Fellowship of the Ring overflows with poignant emotion and delicate beauty - a favorite! “For the Love of a Princess” from Braveheart was a new piece to these ears, and it’s also a beauty with passion and tenderness flowing from every note. While some of the themes are classic (“Love Story,” “Love theme from The Godfather," and especially “My Heart Will Go On” from Titanic), my longtime piano teacher’s ears have lost their enchantment with them no matter how well they’re played or arranged. I still love Henry Mancini’s “Moon River” and Vangelis’ theme from Chariots of Fire, though, and the arrangements on this album are wonderful! I also really like the Rain Man theme, “Cavatina” from The Deer Hunter, and the main theme from Schindler’s List. If you have a passion for beautiful movie music played with classical elegance, Score is a great choice! It is available from Amazon, iTunes and many streaming sites.